They are the largest animals to have ever lived on Earth and can cause serious injury with a mere flip of their tail. But one man braved the Pacific Ocean in just a kayak to capture these rare images of blue whales at play. Rick Coleman posted a video of his sea voyage off the coast of Redondo Beach, California, on YouTube to give viewers a glimpse of the 100 feet, 200 ton mammals up close. He even got out of his relatively small vessel to film the huge beasts underwater, using his GoPro1080 camera. In a video shot a week earlier and also posted on YouTube, Mr Coleman catches a blue whale emitting a spectacular vertical spout of water while coming to the surface to breath. The spouts can reach up to 39 feet high. Of his October 9 experience, Mr Coleman said on the site: 'A whale lunge feeding right next to the Kayak, plus some underwater footage. He also cautioned against anyone trying a similar thing. 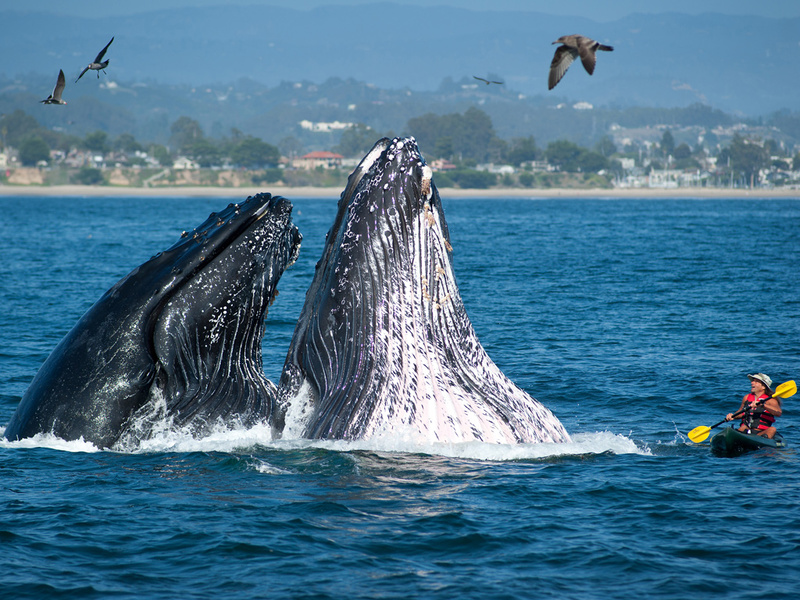 'I'd like to take a moment to state that I don't recommend, endorse or in any way want to encourage anyone to try and swim with these whales,' he wrote. Mr Coleman said that the whales have been swimming approximately three to five miles out from the King Harbor port, and that there is a small dock for launching kayaks by hand. Of his October 1 trip, Mr Coleman wrote: 'One Blue Whale obscured my lens with some whale spit. Another popped up much closer than expected and I had to hit the brakes. It was absolutely incredible to be in the presence of such a remarkable animal. There are only between 10,000 and 25,000 blue whales still swimming the world's oceans after aggressive hunting in the 1900s by whalers seeking whale oil drove them to the brink of extinction. They have been on the endangered species list since the 1960s but have managed only a minor recovery since then. Sandra Bessudo, a french origin woman, saved from illegal fishing the Malpelo island, in the Colombian Pacific. birth place for different rare sharks and other marin species. She is nom minister of the environnement of Colombia, in the Juan Manuel Santos government. 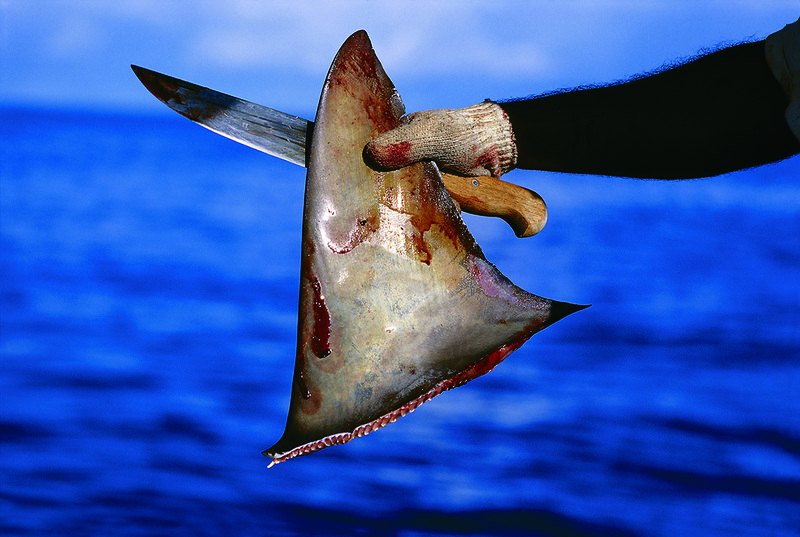 Environmental authorities say up to 2,000 hammerhead, Galápagos and silky sharks were slaughtered for their fins. Colombian environmental authorities have reported a huge shark massacre in the Malpelo wildlife sanctuary in Colombia's Pacific waters, where as many as 2,000 hammerhead, Galápagos and silky sharks may have been slaughtered for their fins. Sandra Bessudo, the Colombian president's top adviser on environmental issues, said a team of divers who were studying sharks in the region reported the mass killing in the waters surrounding the rock-island known as Malpelo, some 500 kilometres from the mainland. "I received a report, which is really unbelievable, from one of the divers who came from Russia to observe the large concentrations of sharks in Malpelo. They saw a large number of fishing trawlers entering the zone illegally," Bessudo said. The divers counted a total of 10 fishing boats, which all were flying the Costa Rican flag. "When the divers dove, they started finding a large number of animals without their fins. They didn't see any alive," she said. One of the divers provided a video that shows the finless bodies of dead sharks on the ocean floor. Calculating an average of 200 sharks per boat, "our estimates are that as many as 2,000 sharks may have been killed," Bessudo said. The sanctuary covers 8,570 square kilometres of marine environment that provides a habitat for threatened marine species – in particular sharks. Divers have reported sightings of schools of more than 200 hammerhead sharks and as many as 1,000 silky sharks in the protected waters, one of the few areas in the world where sightings of short-nosed ragged-toothed shark, known locally as the "Malpelo monster," have been confirmed. In 2006 Unesco included the Malpelo park on its list of World Heritage sites. Bessudo, a marine biologist, has spent much of her career in Malpelo and fighting to preserve the unique marine environment there. But the high concentration of sharks in Malpelo and the remoteness of the marine sanctuary draws illegal fishing boats from nearby nations which trap the sharks, strip them of their fins, and throw them back into the water. Shark fin soup, considered a delicacy of Chinese cuisine, can fetch £63 per bowl in a Hong Kong restaurant. Colombia's navy sporadically patrols the waters and maintains a small outpost on the 1.2 square kilometre island, which is 36 hours from the nearest port. At the time of the reported shark finnings, however, no navy ships were nearby. Once the report of the finnings were made public, the navy dispatched a ship to the area and on Sunday reported the seizure of an Ecuadorian fishing boat, caught with an illegal catch of 300kg, including sharks and other species. At the same time, Colombia's foreign ministry took up the issue with the Costa Rican government, which vowed to co-operate to help stop the practice by ships registered under its flag. In a communiqué, the Costa Rican foreign ministry said it "energetically condemns" the reported finning and said it would prosecute if the participation of Costa Rican flagged ships were involved. At least three of the ships were identified by their names: the Marco Antonio, the Jefferson and the Papante. "When the divers dove, they started finding a large number of animals without their fins. They didn't see any alive," she said. Divers have reported sightings of schools of more than 200 hammerhead sharks and as many as 1,000 silky sharks in the protected waters, one of the few areas in the world where sightings of short-nosed ragged-toothed shark, known locally as the "Malpelo monster," have been confirmed. In 2006 Unesco included the park on its list of World Heritage sites. About two-thirds of the body is made of what is essentially seawater. Our minds are also linked to the ocean, he says, in some surprising -- even game-changing -- ways. Nichols’ passion for the marine environment has made him one of the world’s most inspirational speakers on ocean conservation. In June, he organized the first Blue Mind Summit: a revolutionary new approach to studying -- and energizing -- the complex relationship between humans and the sea. The idea behind Blue Mind is simple: If the ocean has a direct, neurological impact on our brains, an awareness of this connection will change the way we treat it. The implications of this premise are profound; they may, Nichols believes, revolutionize the way we teach conservation and ecology. "J.," as he prefers to be called, is a research associate at the California Academy of Sciences in San Francisco, and founder/co-director of Ocean Revolution, an international network of young ocean advocates. He earned a PhD in wildlife ecology and evolutionary biology from University of Arizona for his work with Mexico’s endangered black sea turtle, and has authored more than 50 scientific papers. A resident of Davenport, California -- where he lives with his wife and two daughters -- J. juggles a daunting speaking and research schedule, traveling around the globe to promote his humanistic view of conservation. He spoke to OnEarth shortly after the inaugural Blue Mind Summit. He had just learned that 2010 turned out to be the best nesting season in nearly three decades for the endangered black turtle. The recovery owes much to grass-roots community organizing, building personal relationships, "and perhaps even 'love,'" mused J., "as radical as it may seem." What do you mean by the term "Blue Mind?" When we think of the ocean -- or hear the ocean, or see the ocean, or get in the ocean, even taste and smell the ocean, or all of those things at once -- we feel something different than before that happened. For most people, it's generally good. It often makes us more open or contemplative. For many people, it reduces stress. How did you come to link this concept with neuroscience? During my early years of sea turtle research in northwestern Mexico, I was involved not only in science and tracking, but also in conservation. This required building grassroots networks of fishermen and finding out who among them was hunting sea turtles, and how much the turtles were worth. My interest was in measuring, tagging and releasing the turtles; theirs was in taking them home and eating or selling them. But even though I was working with turtle poachers, I found I could engage them on an emotional level. There was a shared appreciation of their beauty. I couldn't, however, find a way to raise that issue with my academic colleagues. There was no language that allowed for serious discussion about the emotions of people doing illegal activities. It was all about economics and how we could pay people to not take turtles. That’s when I decided to start looking at how the ocean makes us feel: not through poetry or music or art, but through cognitive neuroscience. In the early ’90s I started reading the work of Antonio Damasio, who studies the neuroscience of emotion. New brain imaging techniques have opened the door to talk about empathy, happiness and compassion in a scientific way. How did the summit come about? The ocean is the biggest feature of our planet, but when I asked neuroscientists about research on this topic, well, there wasn’t any. That struck me as a huge oversight. So I decided to invite a group of neuroscientists, ocean folks, journalists and artists to start a conversation about the science of our emotional connection with the sea. How does the ocean affect the brain? Sound, for example, affects our brain and influences our emotions. If I ask you to close your eyes and turn on a recording of the ocean, I can change your mood immediately. There’s a huge body of research on the science of music and the brain, but almost nothing on the sound of the ocean and the brain. That’s probably going to be the first study that comes out of the Blue Mind Summit, because you can transport it pretty easily into the laboratory. Do we have a sense of why listening to the ocean actually affects our brains? There’s a growing body of research on nostalgia, music and memory looking at which songs give you chills, a measurable physiological response. It turns out that in your teens -- between ages 16 and 21 -- you are most likely to put down many of these nostalgic memories. So, I’m hypothesizing, if you spend important time near the ocean during your teenage years, those sounds become part of your soundtrack. They’re the sounds you become most nostalgic about for the rest of your life. But what about people who grow up in landlocked places like Kansas, Hungary or even Nepal? Clearly, they’re not as impacted by the ocean. How does this research relate to their lives? We’re not sure, but I think that these studies can impact the way we handle environmental education anywhere. If we take kids of that age group outside and connect them with rivers, with trees, with animals, with mountains, with the ocean, they will form strong ties to nature. So you’re suggesting that we "wire" a conservation ethic into them. Basically. The idea is, how can we use what we learn about the brain as a tool for building empathy? But it’s critical to do it in a transparent way, so it’s not creepy, like mind control. Instead, it’s actually empowering, because it teaches you how your brain works. I tell my kids: "Because your brain works this way, we’re going to spend some time by the ocean. Hopefully, you’ll fall in love with it!" At the conference, Eric Johnson from Sotheby’s Realty commented that the phrase "ocean view" is the most valuable phrase in the English language. Let’s consider real estate in San Francisco: two penthouse apartments, same building, same layout. One faces the city, one faces the water. The one that faces the water recently sold for half a million dollars more. If we extrapolate that to all the real estate in San Francisco, or the U.S., we’re talking about a trillion dollar premium, thanks to the ocean. It’s a premium added to your restaurant, hotel room or a cup of coffee -- because it comes with an ocean view. And the ocean gets none of that value! So what are some of the most important questions raised by the Blue Mind Summit? How do we make the relevance of the ocean understood to more people? One idea might be to have a grad student calculate the "ocean-view premium" in a bulletproof way and put that number, or range of numbers, out there. That’s the kind of information that you can take into a policy discussion. There’s also the question of figuring out how the ocean reduces stress because we know that stress causes disease. Now we’re talking public health: coastal access as a public health issue. If you can show that a walk on the beach is as good as x-y-z pill for reducing stress, that’s an argument for protecting open space and access to it. Let’s project into the future. How long do we have to "change our minds" about the ocean? Research is saying 90 percent of the big animals in the ocean are gone. So on one level it’s too late. Half of leatherback sea turtles now have plastic in their bodies. All of the beaches I’ve been to in the past decade have micro-plastic in the sand. A lot of fisheries have crashed or are in decline. Ocean acidification is a growing problem. So we’re in crisis now. The response that should have happened 20 years ago didn’t. And the response that should be happening now isn’t happening either. But the ocean’s resilient, and we’re resilient. The plasticity of the human brain gives me hope. I’ve seen what marketers have been able to convince us to buy -- and I think clever marketers could convince us to do good stuff, too. So you're trying to be a clever marketer. Yes, but there’s a difference between neuro-marketing and neuro-conservation. Neuro-marketing hides the "neuro" portion of it; good neuro-marketers are invisible. You don't know they're manipulating your brain, your emotions. I’m not saying this is a silver-bullet answer to our problems, but neuro-conservation, as I define it, tells you about your brain. "Look what happens to your brain on the ocean. Doesn't that feel good?" It builds fascination and self-awareness -- and, ideally, changes behavior. Apple yesterday quietly updated its iPhone 4S tech specs page to note that the device offers not only Assisted GPS but also GLONASS, the Russian version of GPS. Just two weeks ago, Russia launched the last of 24 satellites required for global location coverage, setting the stage to restore GLONASS to its full operational status that had been lost amid economic turmoil in the country during the late 1990s. Far from being a Russia-only service, some current global positioning hardware and software is capable of utilizing both GPS and GLONASS satellite information to provide more accurate geolocation information with faster acquisition times. We have reached out to Apple for comment on whether the iPhone 4S can in fact take advantage of satellites from both systems on a worldwide basis, as it is unclear from the tech specs whether this is the case, but have yet to receive a response. Note : according to IHS iSuppli company, chipset Qualcomm MDM6610 is responsible for navigation systems and data transfer in iPhone 4S mobile phone network. Notably, only the tech specs page on the U.S. site has been updated to mention GLONASS capabilities, with the corresponding page in other iPhone 4S launch countries still listing only Assisted GPS as the device's satellite location service. The Blu is a global mission to create the ocean on the web - an interactive world where every species and habitat is a unique work of art created by digital artists and developers around the world, as a social online experience. Coming to a Web browser near you--a giant user-generated simulation of the world's oceans. Known as theBlu, the huge collaborative project is the first effort from Wemo, a startup built by a series of Hollywood veterans including Academy Award-winning animator Andy Jones, as well as MIT Media Lab director Joi Ito. The idea? To let 3D artists design and model many of the creatures of the deep, and to invite everyday users to explore and learn about the digital sea, and to collect--and buy--the artists' creations. Ultimately, Venice, Calif.-based Wemo intends to use its "Maker Media" platform as the basis for a wide variety of environments. But the company decided on the ocean as the launch project. As a result, thousands of people will soon be spending time following, and searching for, a wide variety of fish species, while those with 3D modeling skills will be vying for the attention of users and their money. According to Wemo founder and CEO Neville Spiteri, theBlu is "a global mission to create the ocean on the Web as an interactive online world where every species and habitat is a unique [piece of] content created by digital artists" and subsequently tagged and, hopefully, collected by users. Essentially, Wemo wants to crowdsource the development of a massive digital underwater universe, Spiteri told CNET, much as Wikipedia tackled the spread of information. There's little doubt that theBlu can only succeed if it generates a critical mass of users. And that will only happen if there's a corresponding amount of content created by the participating artists. But the seed-funded 10-person Wemo hopes to make that happen by allowing anyone who can design 3D models to take part. Artists will vie to design the most popular species in hopes of convincing normal users to buy their work. A screen shot from theBlu, a new virtual simulation of the ocean. Artists and explorers alike are expected to flock to the new environment. But the more species populate the oceans, the more there will be for users to do, and the more time they'll spend in the digital deep. Spiteri said that one benefit to users is that every piece of content comes with a corresponding piece of educational data. That means that the more a user explores, the more he or she can learn. But theBlu is also meant to engage users through social game mechanics. As a result, users are challenged to dive into the oceans and search for specific species. The more new species they spot--and tag--the more sets they complete. And for each set they finish, they get to choose one fish to add to their collection. The other way to collect fish is to buy them. Some will choose to buy more fish, Spiteri said, in order to accelerate their progress. In the early going, theBlu is featuring a group of standard ocean environments--a European coral reef, an African coral garden, Australian open water, Asian sandy bottoms, and American undersea cliffs. But as time passes, additional areas could be added that present things like prehistoric views of the ocean. There's also a social element. If a user sends a fish they've bought or collected into another area, others can connect with them and initiate a conversation. This is a way, Spiteri said, for people to make new acquaintances without any real social obligation. As it stands, theBlu provides a beautiful but limited experience. The content that's already been created for it tends to be colorful and interesting to look at, but there's not very much of it. So Wemo is counting on artists flocking to theBlu and adding more material. If that happens, Wemo foresees its platform being used by all kinds of educational institutions: museums, universities, and others. For now, though, it's all about the beauty and simplicity of our oceans, and the ability to witness wondrous events from the safety of your browser. But don't be surprised if you start getting Facebook alerts about humpback whale migrations in your area, or perhaps giant schools of jellyfish turning up when there's a full moon. If that happens, get ready to get wet. Naturalists and guests on a National Geographic Expeditions cruise in Antarctica witness and record the phenomenon of Type B Orcas working in unison to dislodge a seal from an iceberg. A BBC film crew has captured footage of killer whales working together to create waves to wash their vulnerable prey into the water. The predators targeted a weddell seal that was resting on a small ice floe, sweeping it off the ice to where they could attack it. Scientists who worked with the film crew said the footage revealed new insights into killer whale ecology. The team filmed the sequence for the BBC documentary Frozen Planet. Robert Pitman, from the National Marine Fisheries Service in California, joined the team in order to carry out research and as a scientific adviser on the documentary. He said that the footage was "some of the most amazing wildlife footage ever taken". Although killer whales - otherwise known as orcas - had already been recorded hunting in this way, Dr Pitman said that "to see footage of it in action like that is totally unprecedented". Wave-washing killer whales were first observed by scientists in the early 1970s. "It wasn't seen again for about 30 years," explained Dr Pitman. "Then a tour boat saw it and [a tourist took] some home video. "[The BBC] contacted us because they were interested in filming it. "As part of our research, we're able to tag them [with tracking devices] and follow them," he explained. Killer whales often work in teams to hunt seals, according to scientists from the National Oceanic and Atmospheric Administration in California. Working together, killers whales create waves with their tails. These waves in turn knock seals off their ice flows and into open water, where they are vulnerable. But if the seal happens to hide among the ice after being knocked into the sea, the whales create shock waves with their tails or blow bubbles under the seal to chase their prey out into the open. So, in 2009, Dr Pitman and his colleagues joined the BBC team off Adelaide Island, in the western Antarctic Peninsula, and went in search of wave-washing killer whales. They are not the easiest mammals to track down; killer whales can travel up to 200 miles (320km) in a day as they move around in search of their prey. "But we lucked out," recalled Dr Pitman. "We saw 22 wave-wash attacks on 22 different seals; it turned out that this was actually a fairly common occurrence." Dr Pitman said that the trip generated new insight into killer whale ecology. "It was shocking to us that, although there are lots of different types of seals down there, they were only interested in weddell seals," he said. "We learned a lot; it was a great collaboration." The trip also added weight to a theory that there are actually several different types of killer whale. Dr Pitman believes that there could be four different species in Antarctica alone and that their feeding habits are different - with some hunting mammals and some feeding only on fish. "This is one of the world's most immediately identifiable mammals," he said, "and yet we're still discovering differences the species level." "It just shows how little we know about the life in our oceans." For the past week, we have celebrated the discovery and exploration of our planet. Every October, Earth Science Week provides an opportunity to share wonder and curiosity about our planet. Last week, NASA and other agencies also rekindled the spirit of exploration with a series of research flights to distant Antarctica. And of course, the week brought the annual celebrations of the first European discoverers of America. October 9 is Leif Erikson Day, honoring the Viking (or Norse) explorer who sailed his crew to the first recorded landing of Europeans in North America around the year 1000. There is some evidence that a merchant named Bjarni Herjólfsson may have spotted North American lands around 985, after being blown off course on a voyage from Iceland to Greenland. Herjólfsson supposedly inspired Erikson with his account, provoking him to sail west from Greenland in search of these new lands about 15 years later. According to Norse sagas, Erikson first spotted and landed in a "land of the flat stones," or Helluland. 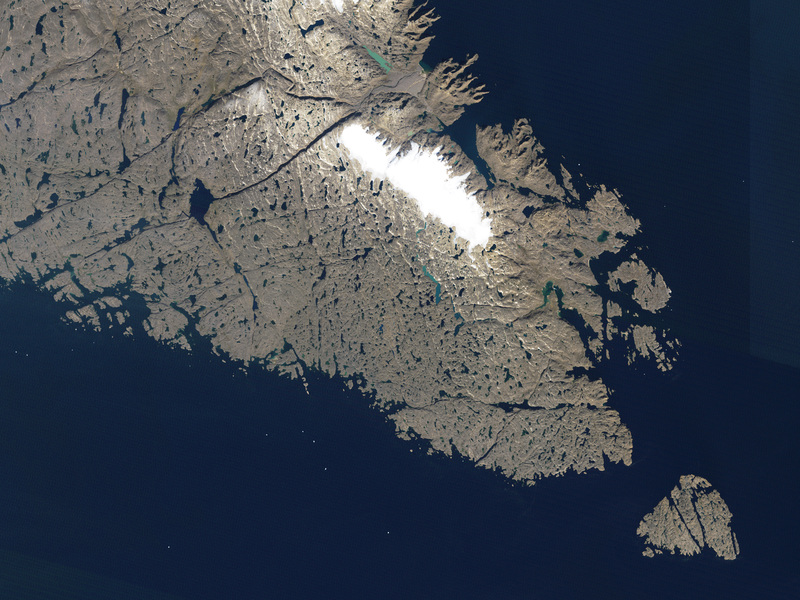 That rocky, flat, barely vegetated land mass is now thought to be Baffin Island, shown in the second image above. Unsure of the prospects there, Erikson's expedition sailed south to what they called "Markland," or "the land of forests," likely along the Labrador coast of Canada. They eventually formed a settlement at Vinland, "the land of wine" or "land of meadows" in Newfoundland. On October 12, we commemorate the day when the lookout Rodrigo de Triana first spotted land for the Christopher Columbus-led expedition to find a western route to the Orient. The crew landed that same day on the island in the Bahamas, which Columbus named San Salvador (or "Holy Savior") and the Lucayan natives called Guanahani. The island shown in the top image above was named San Salvador in 1925 in the belief that it was that first island. 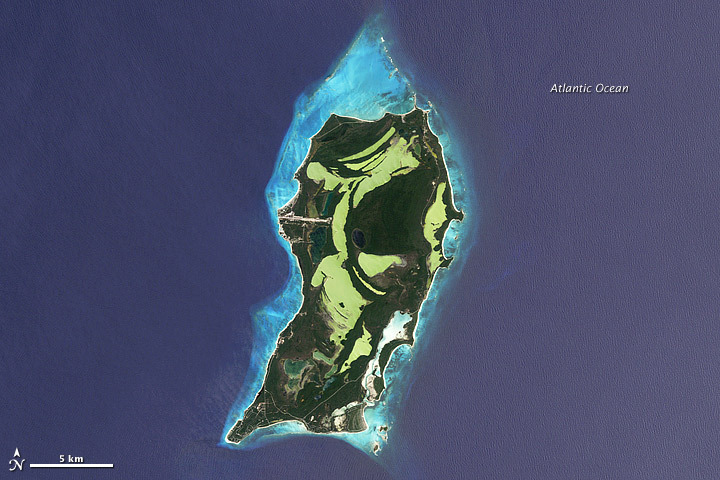 Other scholars have suggested the landing spot may have been on Samana Cay or Plana Cays. 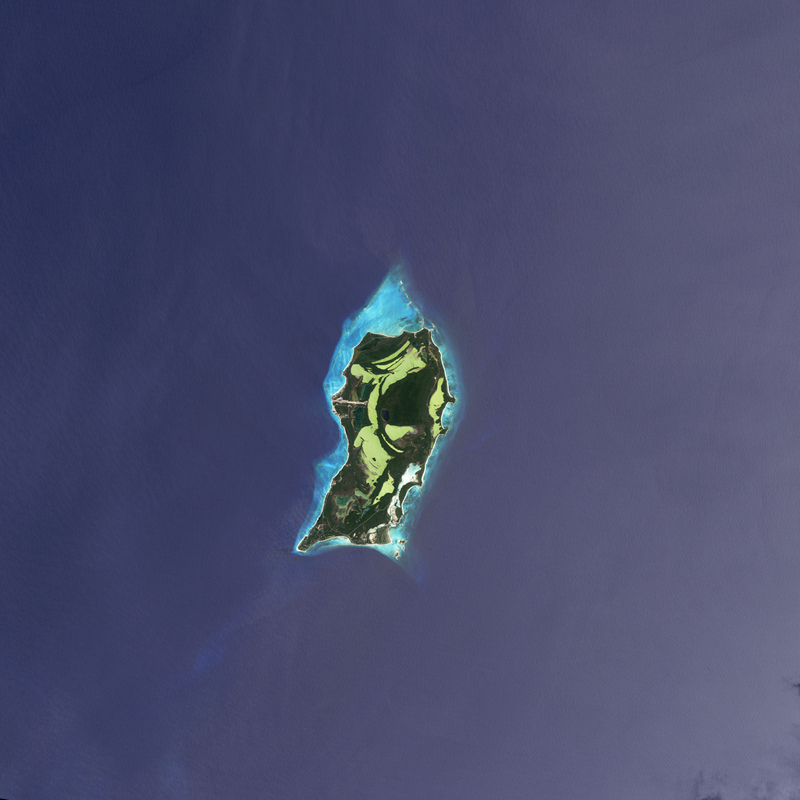 San Salvador is also known as Watling Island. Of course, the debate over who “discovered“ the Americas and where loses some of its bite when we consider that native tribes populated the western hemisphere 12,000 to perhaps more than 20,000 years before any Europeans arrived. A fangtooth, photographed at about 2,600 feet (800 m.) below the surface of California's Monterey Bay. This fish's fierce appearance belies its size — it's only about 5 inches (12 centimeters) long. But thanks to its huge mouth and teeth, a fangtooth can grab and eat fish and squid almost its own size. Dive beneath the ocean's waves, past the sunlit, teeming waters near the surface, through the oxygen-deficient zones nearly devoid of life, down, down and down some more, to a place where the pressure would crush a human, and you will find the mysterious, alien world of the deep sea. It is 300 times the size of the space inhabited by Earth's land-dwelling species. It is unimaginably cold and cloaked in near-total darkness. Yet the blackness is alive, swarming with untold armies of fantastical creatures. Some are laughably large, some shoot shimmering sprays of light from their bodies, still others are outfitted with menacing frippery befitting a sinister Dr. Seuss book. Despite the fact that this alien world is relatively accessible compared with the planets even in our own solar system, the deepest depths of the ocean remain virtually unexplored — the final, mysterious frontier of our home planet. Although the deep sea — roughly defined as everything below 650 feet (200 meters) — comprises a stunning 240 million cubic miles (1 billion cubic kilometers) and more than 90 percent of the living space on the planet, scientists are still trying to answer the most basic questions about it. "Basically, we know so little about the deep sea that we don't know what we don't know. A lot of things are still being discovered purely by chance," said Michael Vecchione, a biologist with the Smithsonian Institution, and one of the few people who have actually been there. But the deep sea is getting more attention these days, thanks to interest from several well-funded parties in sending humans to the deepest spots on Earth aboard a crop of newfangled submersibles. British tycoon Richard Branson's Virgin Oceanic effort may be the best-known of the privately funded endeavors, while countries such as China are also showing interest in the oceans' most inaccessible places, albeit for different reasons. A remotely operated vehicle (ROV) caught sight of this bizarre squid swimming placidly along 11,100 feet (3,380 m) down, off the coast of Oahu. Known as the bigfin squid, the creatures were only discovered about a decade ago, and much about them remains mysterious. This animal was estimated to be 13 to 16 feet (4 to 5 m.) in length. In 2003 Vecchione descended aboard a Russian submersible to the Charlie-Gibbs Fracture Zone, a gash in the mid-Atlantic seafloor that is 14,760 feet (4,500 meters) at its deepest. Vecchione and other scientists who study the deep sea say one of their biggest challenges is trying to figure out what exactly lives down there. Although the Census of Marine Life, a decade-long international study, uncovered more than 1,200 new species (excluding microbes) in the planet's oceans, the study also highlighted just how much humans still have to learn about the deep ocean in particular. "There must be many animals, possibly large animals, down there that we don't know about," said Edith Widder, CEO and senior scientist at the Ocean Research and Conservation Association. Over the last several decades, scientists have found some bizarre and massive creatures dwelling in the deep, such as the megamouth shark, a filter feeder that grows up to 18 feet (5 meters) long. Only dozens have ever been seen since they were discovered in the 1970s . "When they were first discovered, it was a complete surprise — nobody knew they even existed," Vecchione told OurAmazingPlanet. Within the last 10 years, two large squid species have been found, he said, "and there are other large things in the deep sea we've gotten glimpses of but have never caught, so we don't know what we're going to discover." Both Vecchione and Widder study the biology of the open waters of the deep ocean, known to researchers as the water column — a region even less explored than the ocean floor, and whose inhabitants are more difficult to find. Unlike medusa (what most people think of as jellyfish), ctenophores have sticky tentacles that capture small animals and particles, but do not sting their prey. "Stuff that's on the bottom, some of it moves, but not very fast, and a lot of it is just stuck in one place," Vecchione said. "But in the water column, things move around." And, Widder said, those things can outrun a researcher's trawling net. Until the relatively recent development of manned submersibles and remotely operated seafaring robots, nets were one of the few tools available to scientists trying to sample life from the darkness of the deep. And those nets missed more than just fast-moving animals like squid. They missed an entire class of creatures that appear to be one of the dominant life forms in the deep sea, a finding scientist Bruce Robison called "one of the biggest discoveries we've made in the last 10 years or so." "It's not until we started going down there that we realized, 'Holy cow! There's an astonishing number of gelatinous animals down here,'" Robison, a senior scientist at the Monterey Bay Aquarium Research Institute, said in an interview. The deep ocean is a weird universe of jellyfish and their relations, sometimes forming chains many feet long, often lit by shimmering flickers of bioluminescence. It turns out they account for a whopping 25 percent of the biomass in the deep. "Maybe more," Robison said. "But we didn't know that, because if you drag a net through deep water, any of these gelatinous animals are shredded — they either turn into so much goo or pass through the net." Fanciful gelatinous organisms like this one are far more plentiful in the deep sea than previously suspected. Credit: Kevin Raskoff © 1999 MBARI. "We don't know what the food web is like," Robison said. "We don't know how that organic material transfers through the immense food web down to the deep sea floor —we know it goes from the beginning to the end, but as to how it gets there we're still in the dark, literally and figuratively." To survive and communicate in the perpetual twilight or permanent night of the deep — whether to find food, find a mate, or stave off an attacker — many of the inhabitants make their own light. Bioluminescence is Edith Widder's specialty, and she says scientists are only beginning to understand what she calls "this language of light." Given the sheer volume of the deep sea, Widder said, a huge proportion of the animals on our planet are bioluminescent, and yet little is understood about the myriad ways organisms use self-made light. Widder says she feels very fortunate to have witnessed the spectacular underwater shows for herself. "It's magic," she told OurAmazingPlanet. "It's Harry Potter stuff to have these explosions of light all around you — these pinwheels of light. It's absolutely breathtaking, and of course the more you know about it, the more exciting it is — you can recognize animals by their display." Mollusk mamas: It was only recently discovered that these small squid, Gonatus onyx, care for their eggs for months before they hatch in the deep sea. The egg mass is suspended from hooks under the squid's arms. Although it may lack the aesthetic thrill of deep sea biology (who can resist a fragile creature that can squirt light in the path of a lunging squid? ), many scientists are also looking to the deep sea to try to solve some big questions about the role it plays in Earth's climate. "The oceans are taking up a huge amount of the heat that results from global warming. We have a pretty good handle on how much the upper ocean is warming, but not as good a handle on how much the deep ocean is warming," said Gregory Johnson, an oceanographer with the National Oceanic and Atmospheric Administration's Pacific Marine Environmental Laboratory. "In order to predict how much and how fast the Earth is going to warm in the future due to changes in greenhouse gas concentrations and other changes, we need to know how much energy it's taking up now," Johnson said. "That's a very important constraint for predictions. And the oceans take up the vast majority of the heat." Scientists depend on ships and, to some extent, a growing but still comparatively tiny network of ocean buoys to take measurements of conditions in the deep ocean — everything from temperature to salinity (salt content) and water chemistry. Like biologists, oceanographers and climate scientists lack access to much of what they're trying to study. "We are so observationally limited right now," Johnson said. "It is still very much a time for exploration and discovery." An anglerfish, about 4,800 feet (1,460 m.) down, off the coast of California. This fish uses a glowing lure that dangles from its head to entice prey within striking distance of its large mouth. And because so little is known about the deep ocean and the mechanisms that govern it, the possibilities are rife for grand discoveries. One overarching question confronting deep-sea scientists across many disciplines concerns the ingredients and mechanics of our planet as a whole: How does what we do up here affect the deep oceans, and how do the deep oceans affect things up here? "In many very real ways, the deep ocean is like the flywheel on the engine of the planet. It dominates organic carbon flux on Earth. And the magnitude of it is so great that I think we fail to appreciate it," said MBARI's Robison. "But if we start tampering with it,and clearly we are, then we could see some very big changes in the part of the planet where we live." Cindy Lee Van Dover, a marine scientist and professor at Duke University, said that the way carbon is cycled by the animals that live in deep oceans is of great importance. It affects the chemistry of the deep, which affects the oceans in general, which affects the atmosphere — and vice versa. "The deep sea, the ocean, the atmosphere — we're still trying to figure out how all those are connected," Van Dover said. Grand ambitions of a unifying theory aside, scientists at this point are still just trying to figure out what is there, she added. This strange creature lives in deep, oxygen-limited areas from around 2,000 to 3,000 feet (600 to 900 m.) depth. It has glowing tentacle tips, and two glowing spots on the sides of its body. When disturbed, vampire squid can emit a glowing slime. "It's as fundamental as Lewis and Clark going out and mapping out habitats west of the Mississippi — and they had the advantage of being able to see things," Van Dover said. "I don't want to exaggerate, but I think we're in that phase of exploration. The Yellowstones are still out there to be discovered." Vecchione agreed: "We're still exploring in space, and we should still be exploring in the deep ocean as well." More humans, 12 in all, have walked on the moon than have traveled to the deepest parts of our own planet. Only two have the distinction of visiting the very deepest spot on Earth, the Challenger Deep in the Mariana Trench, which lies 36,200 feet (11,030 meters, or nearly seven miles) beneath the surface of the western Pacific Ocean. In 1960, U.S. Navy Lt. Don Walsh and Jacques Piccard, a Swiss native, rode a massive metal vessel to the seafloor and spent 20 minutes in the darkness there. To this day, humans haven't returned. Although exploration for the sake of exploration is important, many scientists say that the stakes for understanding what happens in the deep are high for everyone — not just for billionaires with a penchant for exotic travel or nations with an eye on the resources in the deep sea. "We don't know enough about how the ocean works to be able to predict stuff," Robison said. "That's why I think we need to keep studying the deep sea and the sea in general, because there isn’t any question that we're changing things — and changing them profoundly and rapidly. And if we do that without being able to predict the consequences, that's not very bright."